This Hotel is 100pct non-smoking Hampton Inn Orlando-International Airport hotel of Florida is located off SR 436 one mile north of Orlando International Airport. Area attractions include the Florida Mall Sea World Universal Studios Walt Disney World and Dixie Stampede 21 miles southwest of the our Hampton Inn Orlando-International Airport hotel in Florida. Within .5 mile you can dine at Bennigan*s Chili*s Denny*s or TGI Friday*s and Tony Romas. We feature 123 hotel rooms 24-hour complimentary airport shuttle service meeting rooms to accommodate up to 50 people an outdoor hotel pool and exercise room. Hampton Inn Orlando-International Airport hotel amenities include an **on the house** hot breakfast in-room coffeemaker mini-fridge/microwave hair dryer and TV with cable. 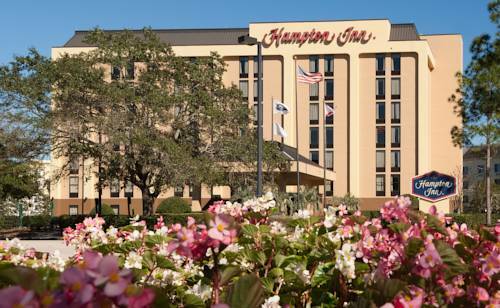 Our Orlando Florida Hampton Inn hotel also offers connecting hotel rooms irons and cribs are available. Laundry/valet services and meeting/banquet facilities are available for a nominal fee. We love having you here at the Hampton Inn Orlando-International Airport hotel in Florida. all reservations must be guaranteed with a major credit card or advance cash deposit to hotel regardless of time of arrival. Policy subject to change.